I thought these instructions for DIY Ruffle Cake Pops were pretty great too! You can learn how to make the fun cake pops shown below, here. 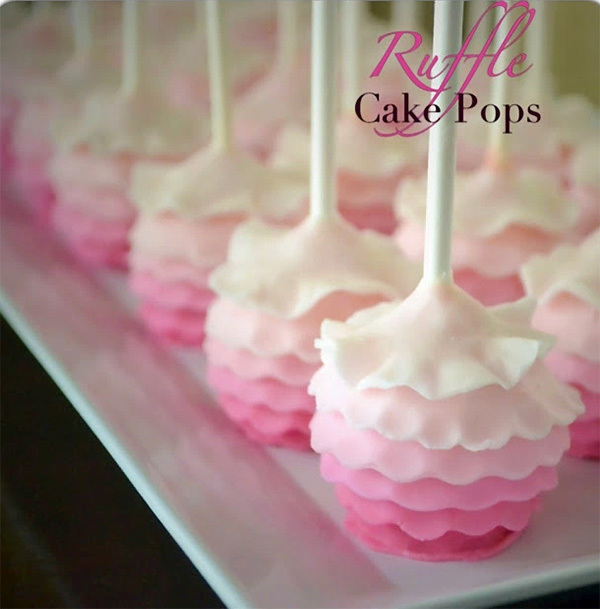 Make your own DIY Ruffle Cake Pops with Pint Sized Baker blog! See just how festive ruffles can be? 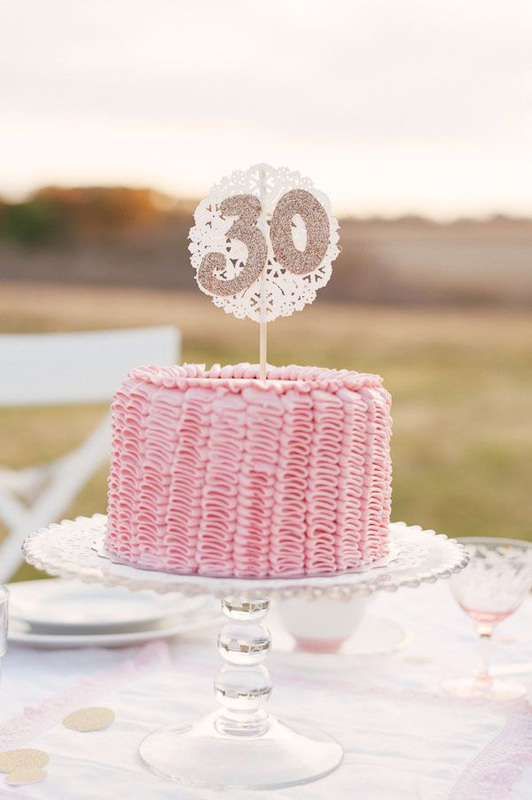 So for your next celebration try this tutorial for you own DIY Ruffle Cake! 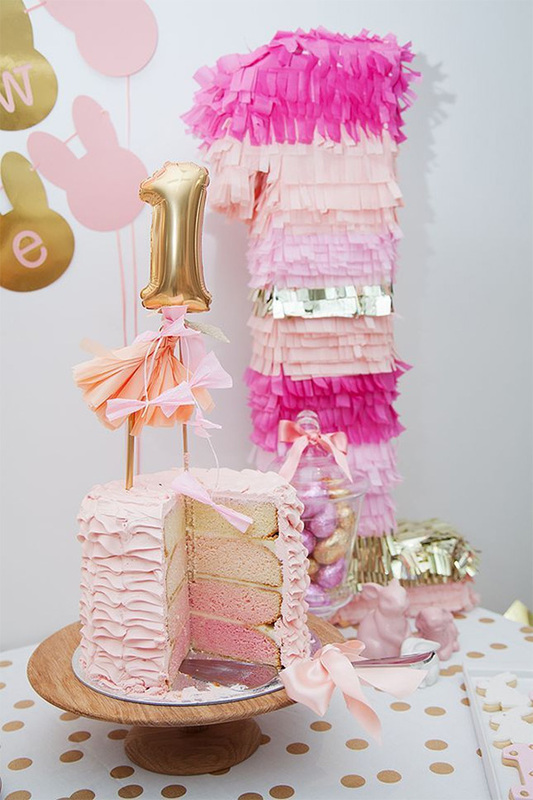 Jennifer Ashley from Pretty Little Details blog has been kind enough to show us just how it’s done. 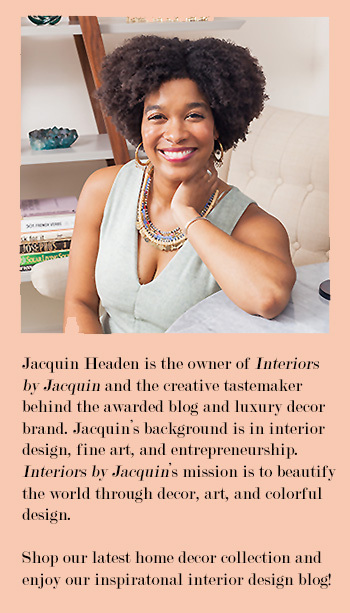 It’s totally do-able at home and oh so chic! Check out how it’s done below. Step 1: The first step is to cover your cake with a thin layer of icing to seal in all of the crumbs. If you have time, it’s ideal to stick the cake in your refrigerator for a half hour or so to help firm up this outside layer. 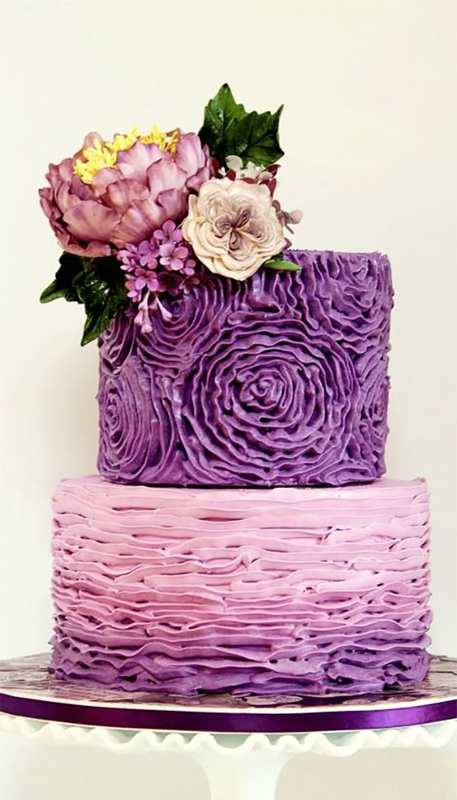 Step 2: Once your crumb coat is finished, you are ready to start piping ruffles. 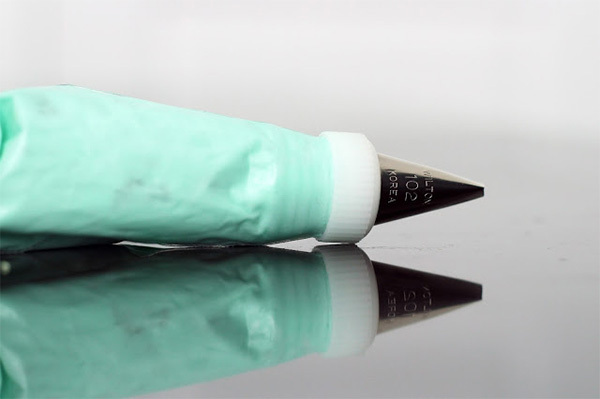 (If you are a perfectionist, you can add one more step at this point and can draw vertical lines spaced 1″ apart in the crumb coat to use as a guide for your ruffles. I opted to just eyeball it, which ended up causing some of my ruffle rows to be a tad bit uneven but in a cute undone sort of way). Step 3: Get out your icing bag! I used a Wilton no. 102 tip to frost my cake, but any petal tip would do the job. Step 4: Starting at the bottom of your first row (thick end of the tip towards the cake) move your icing tip back and forth, stacking the icing to build a vertical column reaching to the top of the cake. Step 5: Continue the process, creating 1″ inch columns surrounding the entire cake. Step 6: How you want to finish the top is up to you! I decided to continue the ruffle theme and used the same Wilton no. 102 tip for the top of the cake. Starting from the outside and working in, I worked my way around the cake moving the icing tip back and forth as I spiralled the icing in. It’s just that easy! 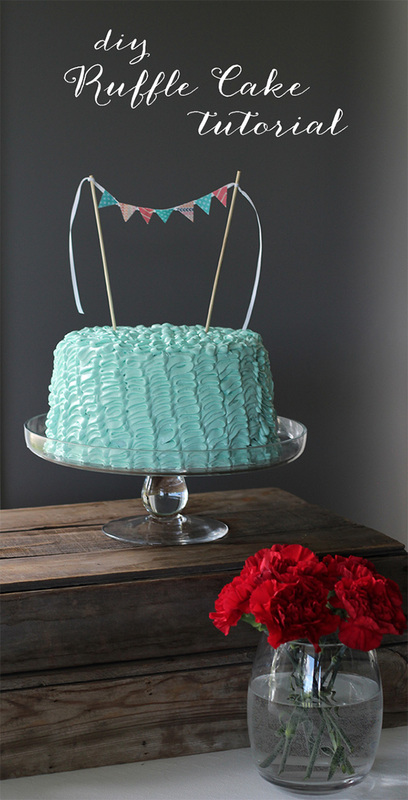 Now the biggest lesson I learned the hard way was this: Don’t try and finish frosting a ruffle cake all in one shot! As I got half way through piping ruffles, I realized they were becoming more messy and starting to droop. What was happening, is the icing bag began to warm with the heat of my hands. Once I realized this, I stuck the icing bag and the cake back in the refrigerator for 5-10 minutes and once again the icing held its shape and created the lovely ruffles I was looking for. 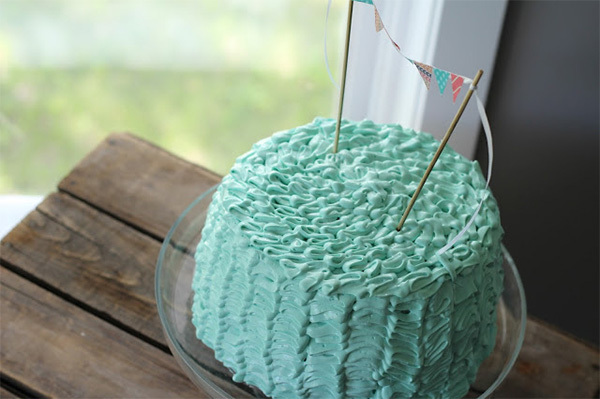 Thanks for sharing this fun ruffle cake tutorial, Jennifer. 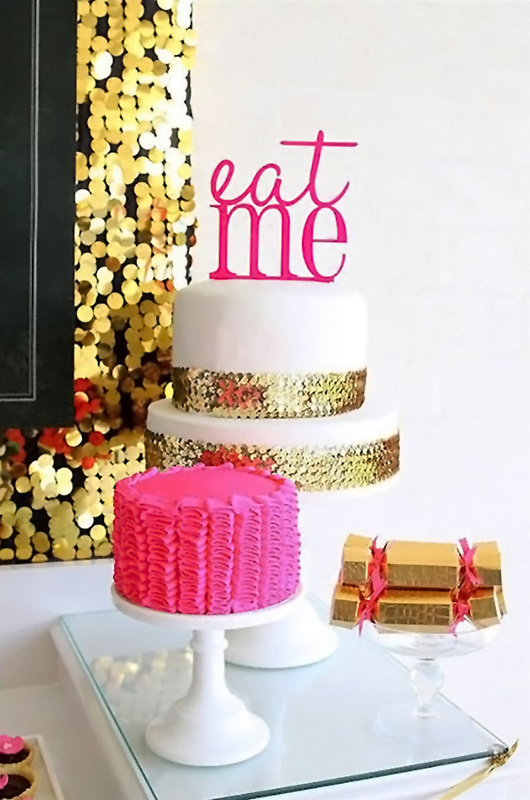 Stop by Jennifer’s blog, Pretty Little Details to see more of her great party ideas.